The event opened with welcome remarks from Roberto Antonione, CEI Chief Operating Officer. Presentations followed by Paolo Dileno, Project Manager of Inter-Connect and CONNECT2CE; Lorenzo Bandelli, Director at the Municipality of Trieste on Innovation, Tourism and Economic Development; Michele Scozzai, Communication and Institutional Relations Manager at Trieste Trasporti, and Massimiliano Angelotti, a representative from the Friuli Venezia Giulia Region. 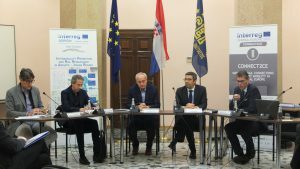 The gathering started with a presentation of a CONNECT2CE first pilot action – integrated intermodal tickets and cross-border ticket on the route Trieste – Villa Opicina – Ljubljana, by Andrea Ballarin and Tito Stefanelli. 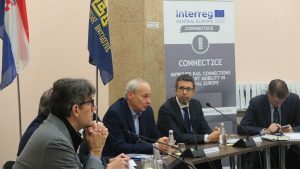 Riccardo Maratini presented the second pilot action – on the cross-border train Mi.Co.Tra and its experimental extension to Trieste, while Giovanni Longo presented an analysis on intermodal accessibility from the Interreg MED project – LOCATIONS. 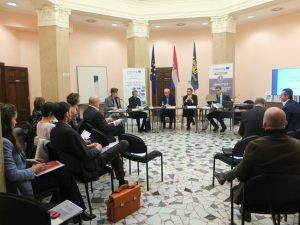 The roundtable discussion – moderated by Paolo Dileno – focused on intermodality in public transport, positive examples from the region, as well as on the complexities of common discourse and visibility. Roundtable guest speakers were Massimiliano Angelotti, a representative from the Friuli Venezia Giulia Region, Roberto Bassanese, director of APTGO, Sabina Carpi from Ferrovie Udine Cividale, Roberto Gerin, director of Trieste Trasporti, Giovanni Longo from the LOCATIONS project, and Elisa Nannetti, director of Trenitalia FVG.